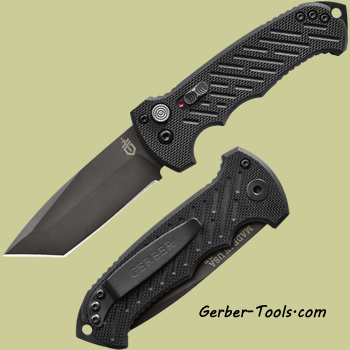 Gerber 06 Auto - Tanto, G-10 Handle, Fine Edge 30-001296. This fully automatic knife features a 3.8 inch corrosion resistant S30V steel tanto blade anchored by an oversized blade release button and a lightweight G-10 handle. There is also a lock down button to keep this blade locked while resting in your pocket. The blade is made of S30V steel. Overall length is 8.5 inches. Made in the USA.